SUNNY BRAE FOREST – Fulfilling years of patient work, the City of Arcata last week secured funding for a massive addition to the Sunny Brae Forest (SBF). The nearly $2 million grant was approved by the state Wildlife Conservation Board at its Tuesday, Sept. 13 meeting. An additional $350,00 was provided by Caltrans. 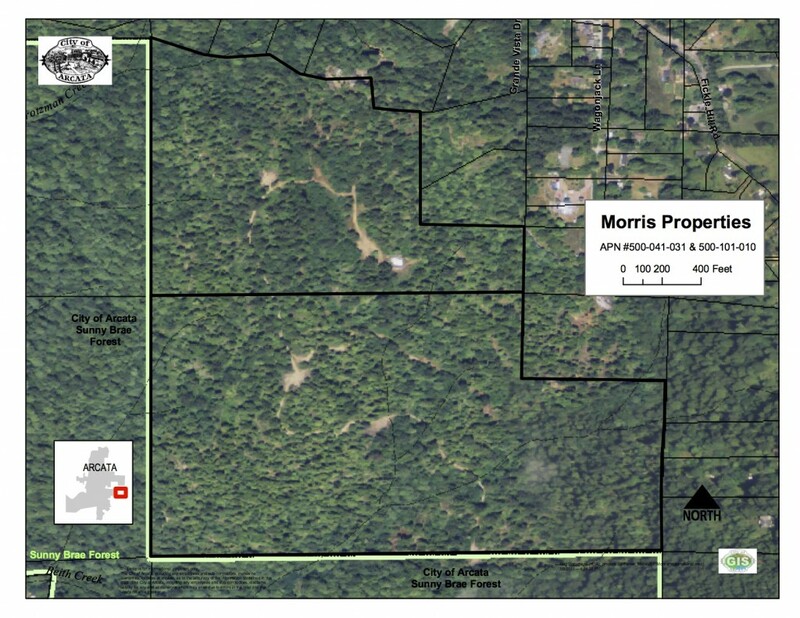 The Morris Property, located on the SBF’s northeast side, will add 114 acres to the 200-acre SBF. The parcel offers key advantages for not just expansion of the SBF’s trail network, but the forest’s maintenance. It allows entry from Fickle Hill Road, vastly simplifying access which will be needed for road maintenance, restoration and logging. The City can now focus on acquisition of other parcels, including one owned by Green Diamond Resource Company and located at the other end of the Ridge Trail. It includes a half-mile segment of the Ridge Trail fronting Janes Creek. 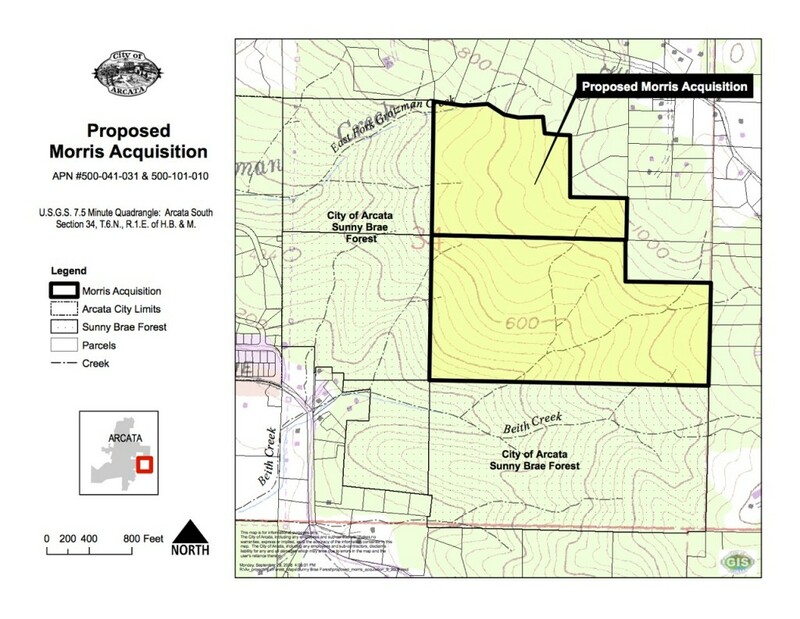 “The City of Arcata is pleased that the state has awarded this grant and recognizes the significant natural area values that will be protected with this expansion of the Sunny Brae tract of the Arcata Community Forest. Benefits include wildlife habitat protection, recreational trail access, watershed and water quality values, viewshed and highly productive working forestland. “Another key parcel associated with our expansion of the Sunny Brae tract is the Schmidbauer parcel, which we are working hard to get funded by the Wildlife Conservation Board at their November, 2011 meeting. “Key to the success of this acquisition has been the dedicated work by our conservation partner, Trust for Public Lands, especially Trish Strickland who worked closely with City staff. “We are grateful to Bob and Carol Morris for working with the City to expand our public forest and also thank George and Mary Schmidbauer for working with us as well, as we hope to add an additional 22 acres to the forest in November. Third District Supervisor Mark Lovelace, who lives just downhill from the forest, was drawn into activism by what was to be an aggressive timber harvest by Sierra Pacific Industries. Organizing the Sunny Brae Arcata Neighborhood Association, he catalyzed the community and City of Arcata into acquiring the property for eventual public use. 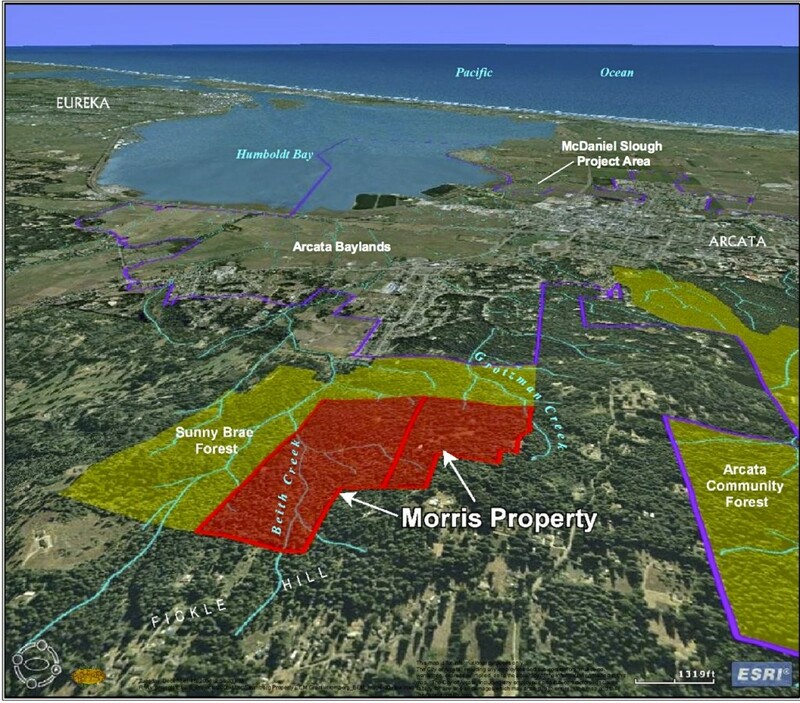 “When we were working on acquiring the original Sunny Brae Forest property, we talked about how it could anchor future acquisitions to expand it and connect it to the existing Arcata Community Forest,” Lovelace said. “It’s been truly amazing to see how quickly the City has been able to turn that vision into a reality. This entry was posted on Tuesday, September 27th, 2011 at 9:43 am	and is filed under News, Community, Environment. You can follow any responses to this entry through the RSS 2.0 feed.